As frustrating as the Black Panther’s absence in the Marvel Cinematic Universe up until Captain America: Civil War might have been, it makes plenty of sense when you remember that as a rule, the nation of Wakanda keeps to itself while the rest of the world gets caught up in global drama. But Wakanda being highly isolationist doesn’t mean that the country and its people simply haven’t existed up until recently. Quite the opposite, in fact. T’Challa was in the MCU this entire time minding his own business, and in The Panther and The People—the new, official comic prelude to the Black Panther film written by Will Corona Pilgrim with illustrations by Annapaola Martello and Jordan Boyd—we see just what that business was. Like most of Marvel’s tie-in comics meant to fill in the backgrounds of its films, the most interesting thing about this particular Black Panther story is that it’s set around the same time in the MCU when Tony Stark first revealed to the world that he is Iron Man. At that point in time, the MCU was a vastly different place that hadn’t yet been full-on attacked by the Chitauri or a legion of murderous Ultron bots. Back then, the world’s biggest problems were still very ordinary, all things considered, and Wakanda was more than busy dealing with the sorts of issues that it’d been handling for centuries. Namely: defending its border. Though Wakanda doesn’t often fraternize with the outside world, its neighbors have spent ages trying to infiltrate the country in futile attempts to access its wealth of vibranium. As the tie-in comic opens, T’Challa, who’d only accepted the Black Panther mantle a week before, is on a routine mission dispatching a gang of Congolese rebels seeking to harm UN peacekeepers near Wakanda. After journeying back home, T’Challa speaks with King T’Chaka about Tony Stark’s announcement to the world, and the present and future kings presciently discuss the fact that a figure like Iron Man is bound to eventually draw attention to Wakanda. While that tidbit might seem unimportant, it does lend itself to the idea that in Iron Man’s wake, Wakanda became even more secretive about itself, fearing increased scrutiny from the outside world and the potential for a much larger foreign challenge. T’Challa’s need to be more discreet about using Wakandan technology outside of the country is made that much more apparent, when T’Chaka informs him that he needs his son to go to Paraguay and rescue two Wakandan citizens who were captured while (confusingly) touring wine vineyards in Brazil with European dignitaries. On some level, this comic is a testament to why Wakanda keeps its interactions with other countries to a minimum because, killer robots or no, the MCU’s earth is still a relatively dangerous place where kidnappings seem to happen all the time. Rather than coordinating with local authorities to secure their people from the hostages, T’Challa sets out along with Okoye, the head of the Dora Milaje (to be portrayed by Danai Gurira in the film), who’s been tasked to monitor the new Panther’s performance in the field. 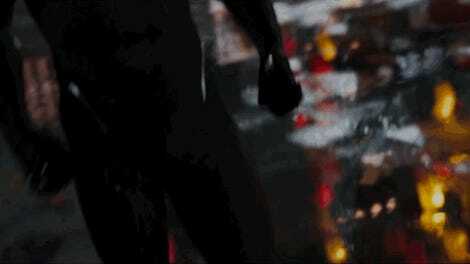 Together, the Black Panther and Okoye are able to locate the hostages and their captors, and engage the latter in combat before the comic ends on something of a cliffhanger. 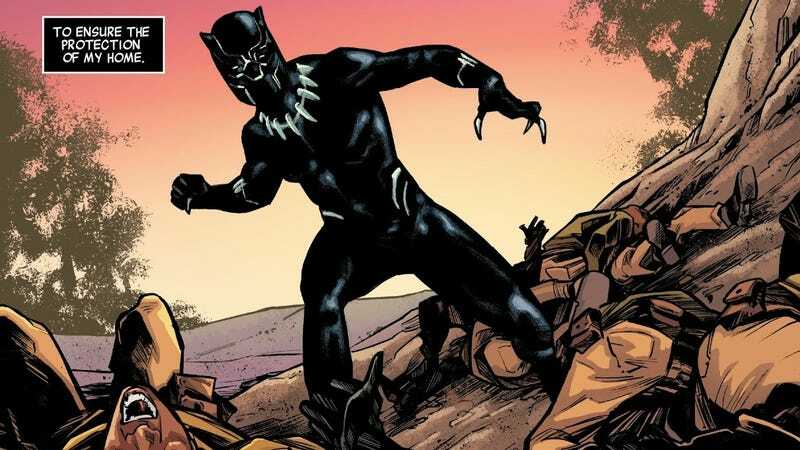 The Panther and The People isn’t meant to be as prosaic and lofty as Marvel’s flagship Black Panther comics, but rather to give us a sense of T’Challa’s place in the Marvel Cinematic Universe when we first meet him. It’s not just that he’s the newly-appointed king, he’s relatively new to his life as a superhero as well. Calm and collected as we might have seen him so far, there’s a very good chance that there’s still going to be plenty for T’Challa to learn about being a hero when Black Panther hits theaters February 16.